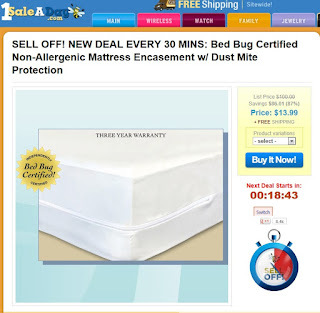 Sisters with Stuff: 1SaleaDay Selloff new Deal every 30 minutes! 1SaleADay is having a SELLOFF!! where hot deals refresh EVERY 30 minutes and it's FREE shipping on the entire site.Great Daily Deals on products for the whole family! See today's deal at 1 Sale A Day! Check out the deal that's going on right now, Mattress Cover w/Dust Mite Protection ANY SIZE twin, full, queen, king. $13.99 and free shipping! 2-Pack: Christina Collection 63" or 84" Voile Panels with Grommets - 5 Color Options! $7.99 with free shipping. Holmes Ultra-Quiet Dual Ceramic Heater with 1-Touch Electronic Thermostat and Illuminated Display! $26.95 with free shipping. Google Android Star 7" Tablet by Pandigital w/ Color Touch-Screen, HDMI, 2GB Memory & MicroSD Card Slot! $49.99 with free shipping. Bangle by FMD White Mother of Pearl Dial Japan Quartz Movement Metal Bangle Ladies Watch + Fossil Warranty! $6.99 with free shipping.